Bass Champs payback just keeps getting more incredible. In the fourth of five tournaments for the East Texas Region on April 13, 2013 anglers enjoyed a whopping 122% payback percentage. Arkansas anglers Scotty Villines and Charles Jones championed the event taking home over $20,000. 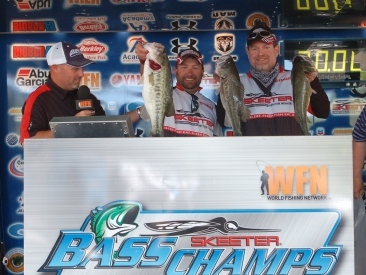 Sam Rayburn and Toledo Bend have been pounded with multiple events running simultaneously, but 140 teams chose Bass Champs to stake their money in and $46,550 was paid back to the top 20 teams in cash and prizes. Sam Rayburn is in great shape, only just a little more than a foot below full pool. Weather conditions were picture perfect with temperatures in the upper 70’s and not a lot of wind. After a full day of fishing, the teams began to trickle in to the scales to weigh their catch. Charles Jones and Scottie Villines brought in the heaviest three fish limit of the day weighing in at 17.50 lbs, anchored with a 6.12 lb kicker. They had driven eight hours from Arkansas to participate in this event and it paid off big for them. “We started off fishing in shallow water, and caught several small bass,” Jones explained. They decided to head to deeper water to see if better bass were there. “We fished a big flat that had some brush on it next to deeper water.” The flat was 14’ deep and dropped out to 30’. Using Strike King 6XD crank baits in a citrus shad pattern, within 30 minutes they boated a limit. “Scottie caught all three of our fish. It took us until 1:00 to put a limit together. We caught a small one in shallow water, culled it, then at 2:00 he caught our kicker.” Oddly enough, Charles had a dream the night before. “I dreamed we won this tournament. I could see it clear as day. On stage, being presented with all of the 1st place winnings. I didn’t tell Scottie about it until after he caught our second keeper. After he caught the big one, I told him we may actually have a chance at winning this thing!” Bass Champs presented the duo with the guaranteed 1st place check for $15,000. They were also the highest finishing team in a qualified Skeeter boat for an additional $5,000 check. Sure Life rounded out their day with another $200 for using the product in their livewell…. Scotty & Charles had been coming down from AR for months. Glad to see them get a victory!